Are Premium Waiver in your Insurance Policies Useful? Some friends and family members have asked me what is this premium waiver that they see in their insurance policies. The amount in premium is very small, so it can’t be very useful right? I think the premium waiver can be rather useful, particularly in certain situations where it might hedge your cash flow in building wealth. I will also show you a similar idea to hedge that cash flow, if your way of building wealth is not through insurance endowment, ILP, retirement plans. A Premium Waiver can be seen as a contract that waives the customer’s obligation to pay for future premium. Usually they exist in the form of riders that latches on to policies such that, should the customer triggers a claim in part of the policy, the customer do not have to pay for future premiums. The sum assured of the premium waiver, is on the premium amount for a specific premium term duration and not the coverage amount or coverage term duration. This 25 year old will pay for this endowment plan till 60 years old, putting $14,000/yr into it. This 25 year old attaches a critical illness rider to the endowment plan, as well as a premium waiver. The annual premium for the premium waiver is $409.80/yr. The premium is 2.9% of the annual premium of the regular premium endowment. In a more tragic turn of circumstances the 25 year old gets down with critical illness. He manages to recover from it. Without the critical illness, the 25 year old would have paid $14000 x 40 = $560,000 in premiums. With the premium waiver, the insurance company waives the premium payment for the endowment from 2020 to 2055 or 35 years. Effectively, the 25 year old do not need to pay $14,000 x 35 = $490,000 in premiums! At the end of the term, the policy matures and the customer can surrender the policy for cash. The premium waiver shines here when the circumstances are challenging in that he cannot work anymore, cannot work in his chosen profession. He does not have to worry about what his future would be. Had he not suffered from the critical illness, he would be able to afford to pay the premiums. Now he may have more medical bills, impeding his ability to continue to pay for the endowment savings plan. 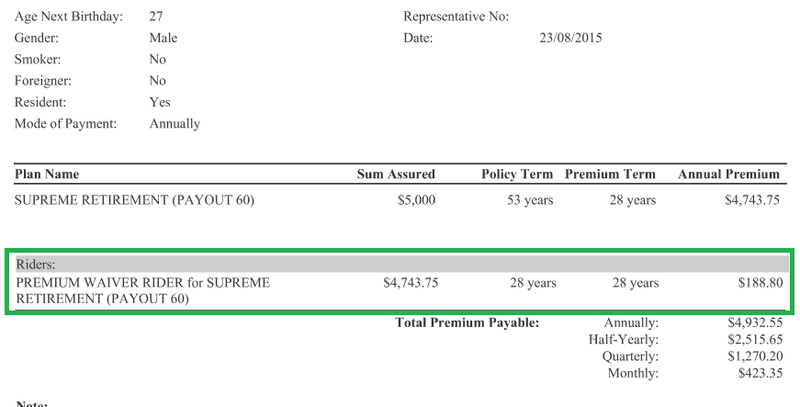 With the premium waiver, he can be assured that at 65 years old, he wold have this sum for his retirement. In the case of this premium waiver, the present value can be computed using a time value of money calculator. Assuming a conservative 3% return for the insurance company, number of years to be 30 years, yearly payment of $14,000, future value to be 0, the present value is $274,406. When the conclusion is laid out this way, it is easy to conclude that the customer got a good deal as compared to the insurer. I would say it is not easy to outsmart the insurer, since if the risk is quantifiable they can package and sell it. The risk to the insurance company is large at the start, but gets smaller over time, as their liability, which is the premium left gets smaller and smaller. If the worry is whether the premium waiver is reasonably priced, one can look at a some what similar product. A decreasing term insurance is a form of protection where the sum assured becomes less as time passes. It is more commonly known to everyone as mortgage insurance. A premium waiver, which waives of the present value of future premiums to be paid looks similar to that of decreasing term. 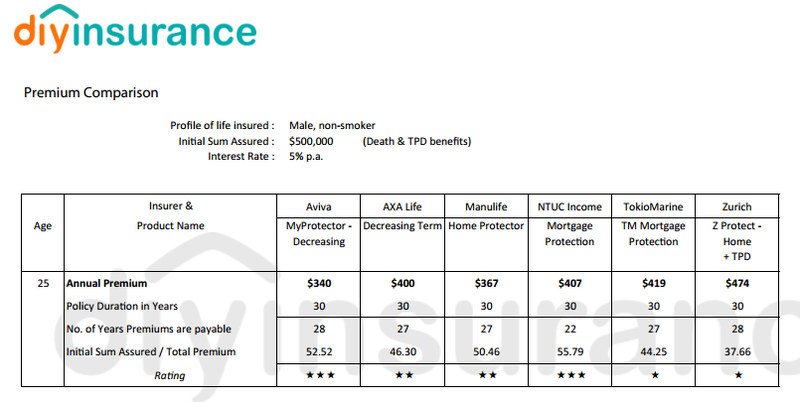 If we look at Aviva MyProtector, a well known decreasing term, where we attached a critical illness rider to it, for the sum assured of $300,000 (which is equivalent to the present value of the 35 year premium value of the endowment plan) the annual premium is $414/yr. This does not look far off from the annual premium of the premium waiver for the endowment at $409/yr. You can look at it that, if you have an existing endowment, but do not have a premium waiver, you can hedge that risk of suffering from critical illness and not being able to adequately pay for the premium of your endowment in the future by purchasing a decreasing term insurance equivalent to the present value of your endowment’s insurance premium. Whole Life likely to have death, total permanent disability (TPD) and critical illness (CI) coverage bundled together. Not all premium waiver would work the same way in that it transfer the risk of having to pay for a consistently large sum monthly to the insurer. This is because in some protection type, you get to claim immediately. Death, TPD Protection with a Waiver: Not quite useful here, since you can claim death protection upon death, where your future premiums will be waived off. When dead or when you claimed your TPD sum, you do not have the future savings goals to be worried about. Accelerated Critical Illness with Waiver: The illustration above is an additional critical illness plan.Accelerated CI means that you can take out life cover and you build in what is known as accelerated critical illness benefit. This means that you have the sum assured for death but if you suffer a critical illness then the death benefit is then paid out in advanced to you, hence “accelerated benefit”. After the CI benefit is fully paid out, the life cover ceased, hence the policy will be terminated. Thereafter no more premium need to pay. Therefore, if the Accelerated CI sum assured is the same as that for death, CI premium waiver can’t be attached to it. In this case it would work like the Death Protection with Waiver above. Early Critical Ilness Riders with Waiver: These few riders, if paired with Endowment Plans, ILPs and Retirement Plans, would result in potential big savings and mitigation of risks considering endowment, ILP and retirement have long and relatively large premiums. In the endowment example above, we see that the premium to attach the waiver is a low percentage of the actual endowment premium. In reality, most ILP and endowment investments can be lower than $1000/mth due to savings limitation. Percentage wise, if there is an opportunity to get a premium waiver, I believe we should get it, due to the relatively low cost nature. While we can discuss about how much higher potentially if we buy term and invest ourselves. Insurance protection effectively transfers away the risk of inability to put adequately into wealth building to the insurance companies. If we have invested in exchange traded funds, unit trusts, individual stocks and bonds on a recurring basis, the moment you suffer a similar situation, you will face the difficulty of coming up with enough cash flow should you live till 65 years old or more. Two insurance to provide this form of risk hedging comes to mind: disability insurance and perhaps like we mentioned, a decreasing term life insurance with a sum assured of the amount you calculate you need in the future. Can you create your own premium waiver if you invest in the stock market? If you do not have an insurance policy, and use stocks, unit trust to build wealth, you can somewhat create something similar to the premium waiver. The decreasing term insurance with CI pays out when there is a CI event. You take the payout in lump sum and that is your premiums from now till 65 years old. It is your job to deploy this sum to invest to build wealth. How much to buy, would depend on ideally how much you estimate to put into wealth building. Suppose I am a rational wealth builder, and I look to put $25,000/yr for the next 40 years into building wealth. The present value of 40 years worth of $25,000 at a conservative 3% growth rate will be $577,000. So I would purchase a decreasing term of $550,000 or $600,000 sum assured. Upon 10 years in and a CI event occurs and the assured survives. The assured will get a lump sum equivalent of the present value of the amount he will put in wealth building from that year till 65 years old NOW. It is up to him to wisely deploy that lump sum of cash to ensure by 65 years old, he would have build up his wealth properly cause he will not get any more money theoretically. While in some cases, premium waivers look like they are just cosmetics to the actual protection, we have illustrated, when combined well, they can be quite useful. 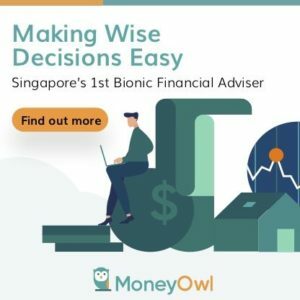 When you next sit down with your financial adviser, do discuss how many of your existing policies have these features and whether certain modifications are needed in your plan. I would like to thank Josephine and Anna from DIY Insurance for explaining some of the nuances of premium waivers in various insurance plans. If you do engage DIY Insurance to shop around and compare protection products, you are not left helpless without a service adviser. They can help you evaluate product comparisons to help you improve upon your original protection or saving intention. This article is brought to you by DIY Insurance. Compare insurance for protection, savings and retirement, get a 30% rebate on insurance commission and empower your family and yourself. Make the right Protection Decision today! The aviva decreasing term also covers for death, so it’s actually much cheaper than the premium waiver rider. I usually don’t use a premium of waiver rider as 1) it reduces the roi of the endowment plan, 2) the actual cost is high, and 3) any coverage for such needs should be addressed by your normal coverage. Hi Martin, thanks for the feedback from an adviser perspective. So what you are saying is that you disagree that the cost of premium waiver is cheap enough versus the benefit that it brings, as there are alternative solutions such as independent plans such as decreasing term?